﻿ Best Price on Hotel Casazul in Flores + Reviews! Featuring rooms with shared terraces overlooking Peten Itza Lake, Hotel Casa Azul is set next to the beach on Flores Island. It offers a 24-hour reception and free Wi-Fi in public areas. 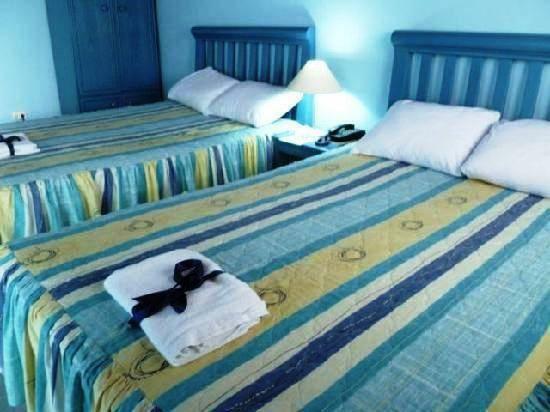 Each air-conditioned room at Hotel Casa Azul has bright blue décor. All rooms have a TV, a mini-bar and a private bathroom with free toiletries. Restaurants, bars and cafés can be found in the center of Santa Elena, just over 0.6 mi from the hotel. There is an additional terrace on the hotel's second floor, which offers lake views. Tikai and Cerro Cahuí parks can be reached in 50 minutes by car. Sayaxché and Machaquia are approximately 56 mi away. Close to many restaurants and bars. Comfortable stay. Friendly staff. We enjoyed out stay at Hotel Casa Azul. Limited English spoken so learn some Spanish. Nice view of the lake and area. centrally located; clean rooms and friendly staff. We came to Casa Azul after our visit to Tikal and ended up spending three days. The third floor terrace is a great place to chill out and read. It is a great place to sit and watch the sun set. There is also a great view of the lake from most rooms. The beds are really comfortable. The ladies who work at the hotel speak only Spanish, but communicating was not a problem. El hotel Casa Azul es una buena opción si uno quiere estar en un lugar céntrico en Flores,cerca de restaurantes,bares y agencias de viajes que organizan excursiones de un día ó de varios a Tikal.Las habitaciones son cómodas y luminosas,las que tienen vistas al lago poseen una terraza en donde relajarse al atardecer contemplando las bonitas vistas que ofrece. Hotel bez żadnych zastrzeżeń, wygodne duże łóżka, przestronny pokój, bardzo dobre położenie przy samej promenadzie gdzie funkcjonuje sporo dobrych restauracji. W pokojach bardzo czysto a na dachu świetny taras widokowy, obsługa miła i pomocna, polecam.